For removing adhesives quickly without damage or mess. The original Adhesive Remover. How about saving some more labor hours? 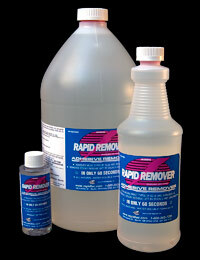 Rapid Remover is a guaranteed labor-saving product. To remove decals and vinyl from signs, windows, autos and many other substrates, many people are using lacquer thinner, MEK, acetone, paint stripper, grinders, etc., all of which are hazardous products. Experienced professionals start by using a heat lamp tree to soften vinyl. After peeling the vinyl off use Rapid Remover to easily remove the adhesive residue. 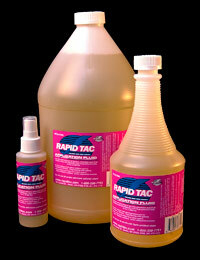 Rapid Remover is a non-toxic, water soluble adhesive remover that breaks down and removes most adhesives in 60 seconds! Spray it on, wait 30 to 60 seconds and easily wipe it off with a plastic squeegee, all with no damage to painted or bare metal surfaces. What may have been a four hour job (and a messy one at that) can now be done in less than half that time. Get the right tool for the job.